My alarm goes off at 6.15am. I hit the snooze button and realise I’ve been dreaming about work. I must be nervous. Not surprised really. Today’s going to be busy, despite the fact that the “text” – all 283 paragraphs of it – was agreed by negotiators yesterday. Today is the high level summit – the day that world leaders including Deputy Prime Minister Nick Clegg arrive. I shower, dress, and receive a quick call from my husband to wish me happy birthday. First time we’ve spoken in 5 days. I head to breakfast. My colleagues who’ve been negotiating the text into the late hours for the past week stock up. We all check our emails – updates have come in from London overnight. My Director General, Michael Anderson – who has just been appointed the Prime Minister’s special envoy on the post-2015 framework, the successor to the Millennium Development Goals – joins for breakfast. He arrived late last night, but is fully briefed on the negotiations, so we talk about his plan for the day. We pile into a minibus. The distance between our hotel and the conference centre is only 12 miles but traffic is awful. En route I notice construction for a new bus-rapid-transit system. Good idea, and green. For today, heightened security measures mean a 2 hour journey. The conference centre is impressive and huge. I’m late and run straight to an event held by the Prince of Wales Charities Trust. They requested a Government official to attend and it’s focused on a topic related to my work at DFID so I’m happy to be there. A few other colleagues head to the main plenary room to monitor what Heads of State and their representatives will say in their national statements. The protocol is that a UK official has to be at the seat all the time, so we’ve prepared a rota. Other colleagues head to the UK office to iron out the diaries for Nick Clegg and the Environment Secretary of State, Caroline Spelman. The logistics are complex. I leave the Prince of Wales event early to meet officials from the World Bank and the Global Canopy programme to go over final details for the UK’s major event at 1 pm today. We’ve met twice and probably exchanged 30 emails over the last 48 hours. The agenda keeps changing. I head back to the UK office which is incredibly busy. Nick Clegg arrives: it’s the first time he’s come to our “nerve centre”. I am called over to brief him about the event along with a Defra colleague. The trick is to impart all the relevant information as quickly and clearly as possible. The brief works – he’s energised by the need for Governments and the private sector to value the natural resources they have – also known as “GDP+”. Yesterday he backed this up with UK announcements – mandatory emissions reporting for FTSE 100 companies and working with the private sector to invest in a ‘knowledge bank’ to protect people living in the poorest forest areas. My Whitehall colleagues have worked hard to make both happen. We head to the event. It’s packed and security are turning people away. Nick Clegg makes a powerful opening speech and I’m reminded of a few sceptical voices a few months ago that said this was too technical a topic to get purchase. This is one of those moments a civil servant can feel proud. But there’s no time to enjoy the moment. Work beckons and I’m hungry. I head to the food hall and realise I’m not the only delegate to be having lunch at 3 pm – familiar faces from my previous life working on climate change negotiations are doing so too. I say hello. It’s always useful to maintain these relationships – they help when organising meetings between Ministers and getting past entrenched negotiating positions. 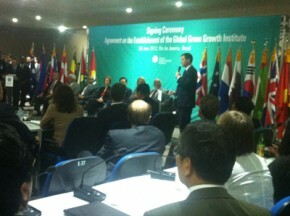 Deputy Prime Minister Nick Clegg making a speech at the Global Green Growth Institute signing ceremony. Over lunch I make phone calls about an event tomorrow and arrange a bilateral with the Ethiopian Government. Suddenly it’s 4 pm and time to join my Director General for a meeting with an organisation that helps developing countries plan for and implement green growth, called the Global Green Growth Institute (GGGI). We’ve been tracking their work for a while and they are keen to demonstrate results and value for money so that the UK can support their work. A couple of hours later the Deputy Prime Minister attends an event confirming that the UK will join GGGI. We will decide on funding after Rio. But what’s great to see in all these events is the vision and commitment that many Leaders here have to the major topics of the negotiating text produced yesterday. These events take the text to another level. With that, it’s almost 9 pm and time to get on the UK delegation bus to go back to the hotel. My colleagues say I look a little tired. But I’m smiling. It’s my birthday and I’ve done my bit to help the UK and others achieve a lot today. It feels good. 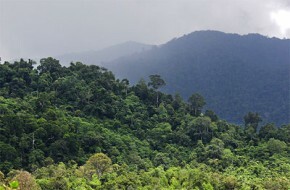 An excerpt of this blog post was featured on the Guardian Rio+20 Earth Summit live blog.